I’ll never look at “Joey Pants” the same way again. From answering phones with the phrase “Moscone Bail Bonds” in Midnight Run to terrifying Jennifer Tilly in Bound all the way up through his intense turn on The Sopranos, Joe Pantoliano has become the go-to guy for mafia roles with his ability to dominate every scene he’s in with his vicious dialogue and despicable actions. Yet, as Pantoliano himself noted in a Tufts University Q&A for his latest film Canvas, (which he also produced), he didn’t want to be defined by his Sopranos character. After only a few scenes of writer/director Joseph Greco’s emotionally moving feature film debut, "Joey Pants" the mobster tough guy is long forgotten. Based on a true story and inspired by Greco’s own childhood living with a mentally ill mother, the filmmaker decided to sublimate not only what he’d gone through artistically (thereby following in the footsteps of both of his creative parents) but also to address the issue of mental illness compassionately and accurately to “combat stigma.” Wholeheartedly embraced by the mental health community as Greco shares in the Tufts Q&A featured on the Canvas DVD, the film stars talented young actor Devon Gearhart as Chris who, as the movie opens, is returning to Florida from Alaska where he’d stayed with his Aunt Joanne. 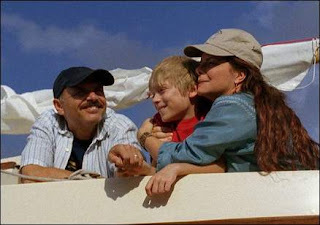 His hopes that his mother Mary (Oscar winner Marcia Gay Harden), who’d begun showing signs of mental illness eighteen months earlier, would have improved are dashed when he realizes that her schizophrenia is slowing taking over as her loyally loving construction worker husband John (Pantoliano) looks on helplessly. After a domestic disturbance ensues when Mary fails to take the always changing medications prescribed by her doctors, she is forcibly institutionalized by the police, leaving John and Chris angrily frustrated and trying to figure out how to get back the woman they both love. While Chris must contend with ridicule from classmates and begins skipping school to head for the beach his aspiring artist mother loved to paint, John sublimates his feelings in constructing the perfect sailboat in the backyard, leading neighbors and other community members to question whether or not both of Chris’s parents are mentally ill.
Beautiful, sensitive, and earnest, Canvas draws strength in its authenticity and it’s an understated, truly independent work sure to get audiences talking, if they’re fortunate enough to track it down. A film festival favorite, having earned the Best Feature Film Award at Sedona, an Audience Award at Ft. Lauderdale, Sarasota and Natucket, Canvas, which has recently been released on DVD, was also chosen by legendary film critic Roger Ebert for inclusion in his 2008 Ebertfest.